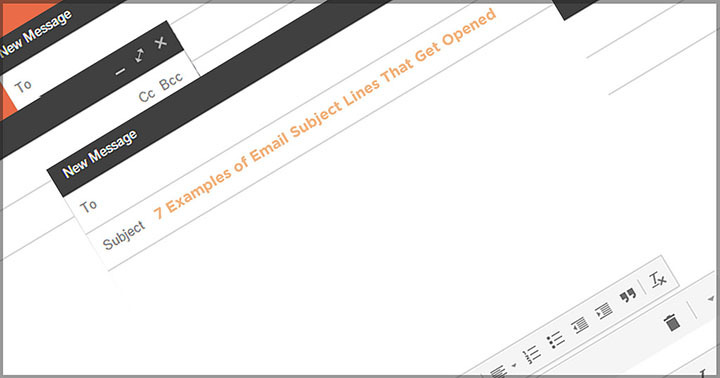 Is there a secret to writing amazing subject lines? There are actually several. Researchers have been studying what works in email marketing campaigns, and these are some of the top takeaways. Besides general, generic advice that encourages overall mastery of marketing copy, these are the specific things a company can do to get noticed in just a few words and get more click-throughs and conversions. Stick to these rules of thumb and you'll likely have a good start to crafting a more effective subject line for your email campaign. Between 60 and 70 characters is what email marketers have called the "dead zone," where clicks and conversions rapidly drop. This is sometimes also referred to as the "danger zone," which I've always found funnier. Dropping sales is no laughing matter, though. There are several different reports providing information on where bad subject-line lengths lie, the most famous of which is Adestra's research. They found that emails with subject lines below 60 characters had better click-through rates, and anything above 70 characters had better click-to-open rates. Between those average lengths (60 to 70 characters) is where your email is lost in a sea of monotony; a lot of subject lines are approximately that character length, which is where writers are most comfortable, which is probably why they're often ignored. Less Effective: "Learn More about the Great Holiday Coffee Sales at Joe's Coffee Shop"
More Effective: "50% Off On Coffee at Joe's"
Less Effective: "Free Amazing Smartphone Statistics from Alan's Reporting Group"
More Effective: "We Found that 58% of Users Open Emails on Their Smartphones, and Here's Why Your Business Should Care"
Among some of the most notable changes in recent years is the uber-short, curiosity-gap subject line of 10 characters or less. Most famously, President Obama's campaign emails used short subject lines such as "Hey" or "Change" or "Some scary numbers" and raked in an impressive amount of donations. It's hard to tell if that sort of language will work for you; it's all about brand voice and whether you're hoping for an increase in click-throughs or more click-to-opens. When it comes to personalization, it's not about having templates where you automatically insert your recipient's name. People understand that level of automation. If you contact them about a product they like or something they've done, on the other hand, they'll obviously be more interested. Ask yourself: Why are you bothering to contact your customer? Trigger-based email campaigns are becoming much more common. Contact them for a reason, or, at the very least, showcase the reason why they signed up with you in the first place. Email them when they sign up, when they make a purchase, and when they leave. Also, let them know you care about them. Less Effective: "Sarah Martin, Get Half Off on All Coffee at Joe's Coffee Shop"
More Effective: "Sarah, Caramel Macchiatos Are 50% Off Now!" In the above example, Joe's used data they already had access to to find Sarah Martin's favorite drink: a caramel macchiato. Many companies are sitting on this type of data. Use the information at your disposal to get more engagement. Less Effective: "Buy Now! Get Coffee at Half Off Today at Joe's Coffee Shop"
More Effective: "Only 3 Days Left To Get Joe's Coffee at 50% Off"
More Effective: "Joe's is Introducing 4 New Coffees in February, and We Want You to Try It First (at 50% Off!)" Also, who doesn't love a good numbered list? More Effective: "Top 5 Coffees For Adventurous Drinkers"
Or, how about a "how to" article? More Effective: "How To Impress Her on a Just-Coffee Date @ Joe's"
Inciting clicks can be very difficult, with lots of trial and error required. That's why the most important aspect of this factor is to conduct A/B testing for your subject lines to find which ones are the most effective. Make sure you're looking at lots of data and the right data. That way, you'll have a grasp on the types of clickable content that work with your audience and the types that don't.